Hope your weekend was lovely! I spent mine in Chicago with my good friend Meagan; it was her 26th birthday and I couldn’t think of a better way to help her ring it in then with a girl’s weekend. By the way, thank you for all of the wonderful restaurant and bakery recommendations – you guys are the best! I might have had little too much fun in Chicago. Basically I’m in need of a MAJOR detox. I chowed down on churros, a bottle of wine, and probably an entire platter of chips and guac. HELP. We even hit up a yoga sculpt class in Streeterville. I think it was one of the best workouts I’ve ever had. Which totally gave me permission to eat more food, right? Wrong. Churros = no bueno for the thighs. There was one thing I was really happy about though, and it’s that this lasagna was sitting in my freezer when I got home. I made it last weekend and froze half so that I could enjoy it later. Thank goodness because now I have something healthy for dinner this week. 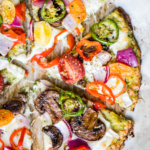 Cheesy, protein-packed, low carb and you get your veggies in. What more is there to say?! You must try this lovely dinner! Sorry my photos aren’t the best. I was in a hurry to get to a workout class and didn’t have time to wait for the sun to cooperate. 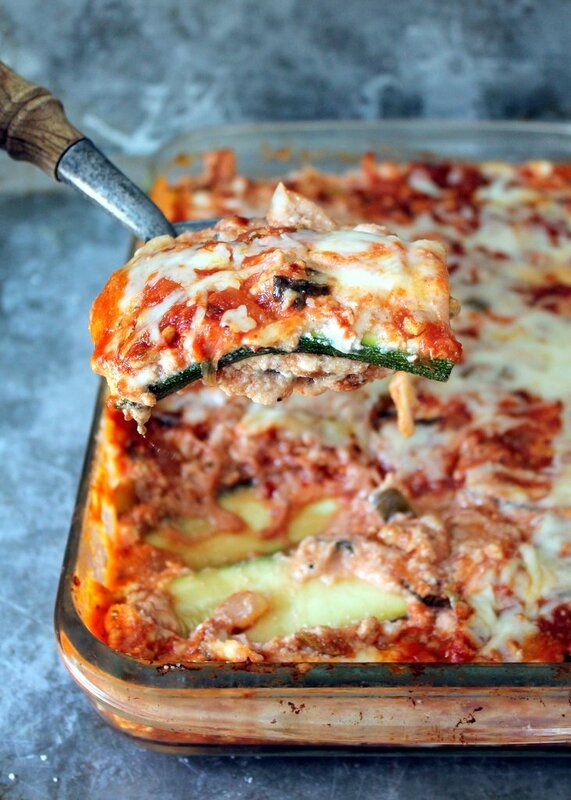 A noodle-less, low carb zucchini lasagna with an incredible turkey meat sauce! To assemble lasagna, spread 1/2 of the turkey meat sauce into the bottom of a 9x13 inch baking pan coated with nonstick cooking spray. 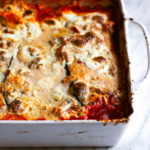 Place zucchini slices evenly over meat sauce, spread on 1/2 of the ricotta mixture, then sprinkle 1/2 of the mozzarella on. Repeat layers again starting with the meat sauce, zucchini slices and ricotta mixture and finishing with mozzarella. Cover with foil and bake for 30 min. Remove foil and bake for 15 minute longer uncovered. Makes 8 very generous servings. 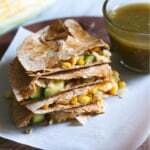 This meal makes great leftovers and is freezer-friendly! 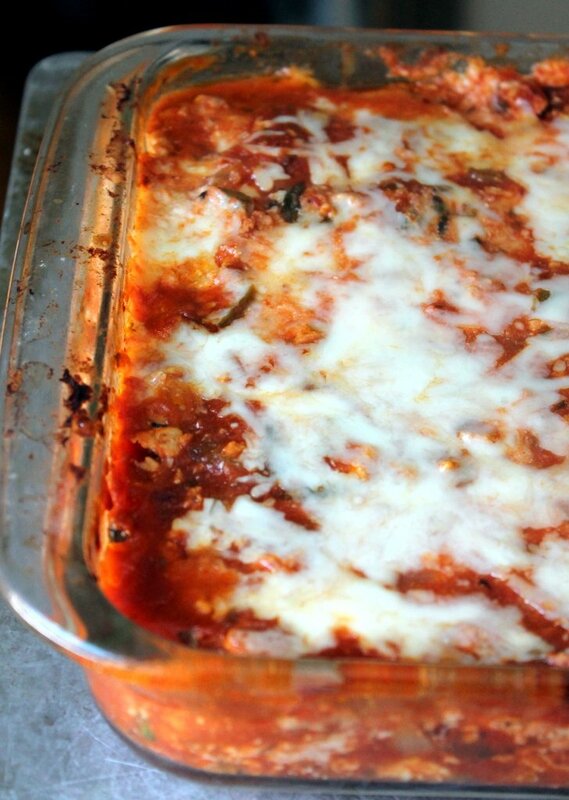 118 Responses to "Low Carb Zucchini Lasagna with Spicy Turkey Meat Sauce"
This is amazing! To simplify, I just used a jar of my favorite no sugar added marinara instead if the paste, tomatoes and sauce. Added fresh basil or other spices as desired. Cuts out many steps. Roasting the zucchini ahead is key. So happy to hear that, Krista! Love this one. You could try low fat or full fat cottage cheese? I think it would work! I take 2 thawed chopped spinach and squeeze out all the liquid and add to the tofu in the processor. What is sodium content in this dish? It’s not listed. 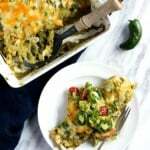 just found this recipe in Pinterest as I was eating my zoodles and turkey meatballs. I am totally trying. This next week! My mom makes an awesome veggie lasagna and chops veggies in her food processor then sautés them. Thanks for the great idea! Ok. I made this awesome lasagna last week. So good! The only changes that I made….didn’t use as much salt. Salting the zucchini slices & adding a pinch to the cheese mix was all that I used. I used a can of fire roasted tomatoes to replace the puree and I broiled the top for a few minutes after baking was complete. I’ll definately make this again!! Just made this recipe tonight and it was soooo good!! I also uses fat free ricotta, low fat Parmesan and fat free mozzarella and it was still delicious! Can’t wait for my left overs tomorrow ! The recipe nutrition stats were high. Is this lower as I would probably eat the whole thing!!! Carbs are still a bit high for me, but sound delicious. I am diabetic and the USDA recommendations for the proper amount of carbs for diabetics sends my blood sugar into the stratosphere! I keep mine down to as close to 25 to 50 grams a day (25 for weight loss) as much as possible. I order a low carb sauce through Netceuticals and use zucchini noodles. So, I am excited to try this recipe for a new variation. Wvgirl, don’t be afraid to replace everything with high fat versions (instead of turkey, full-fat pork and/or beef; all high fat cheeses, egg white with whole egg, etc.). I also have a hard time with carbs, and eating fat helps. This should also lower the carb content, although it’s likely the tomatoes that are providing most of the carbs. Hard to replace that. What’s in the low carb sauce? Zucchini isn’t that high in carbs. For me, I’ll easily eat 2-3 servings of this at one sitting. This sounda like a good low carb recipe. I love Zucchini. However, I don’t like out to be mushy. How do I cook out so it will still have a little bite to it? Very good recipe! I used turkey italian sausage, which I thought added a lot to the recipe. Will definitely make again! What would you recommend cooking this dish at if it was made ahead of time and frozen? Such a wonderful alternative to my *formally* favorite meal: lasagna! Just one thing, when I entered your recipe into MyFitnessPal the recipe came up as 508 calories for 1/8. I cut way back on the cheese and the tomato sauce to keep the calories in check. This recipe is so delicious!!!! I made it for Christmas Eve and making another batch 2 days later! I like how you “dry” out the zucchini first so it keeps the water content down! I also added some fresh slices of tomato and black olives(since I love them). And Nicole just don’t fully cook the zucchini ahead of time (in the oven when drying out the zucchini) and the zucchini doesn’t get mushy. Also don’t go super thin on the slices. The slices that I did a little too thin were mushy so they didn’t make it into the end products. The actually cook time of the whole recipe only heats everything through. Great recipe-thank you! This is a very good recipe. I am not a fan of zucchini, but it makes a tasty and healthy substitute for pasta in this recipe. I did not miss the pasta one bit! I have never commented about a recipe I’ve found online and subsequently cooked, but this was the absolute best lasagna I have ever made (or had). Thanks for the guilt-free recipe! I made this tonight and it was awesome!! I didn’t miss the pasta one bit. I did find that the lasagna was a little too “saucy”. Perhaps I didn’t let meat sauce simmer long enough to thicken up? I will definitely make this again! You can do that, or add a little tomato paste (a tablespoon or two to help it thicken). This is delicious!!! I usually double the zucchini because I like a lot in my lasagna. I also make a lot of meat sauce so I buy those little foil tins and make a small lasagna to freeze. This is perfect for me and my hubby to have on those week nights. Thank you for the recipe! This dish was incredible!I had a ton of veggies from my garden and I was browsing for a good way to use them up and tadaa! Instant new fav. My husband was blown away by it too. How would you count this for 21 day fix?? I want to make this recipe vegetarian for my significant other but obviously can’t use ground turkey (I on the other hand would love it hehe). What could I use as a viable substitution? I know your question was a while ago, but I plan to make this vegetarian by cooking some lentils and roasting some walnuts, then pulsing both in a food processor to get a “ground meat” substitute. It worked great for veggie tacos, hoping it will work here. i made this recipe and it was truly amazing!!!! delicious ! all the family loved it !!! Wonderful! This is my husbands new favorite meal. He wants me to make it once a week. He doesn’t get heartburn after like regular lasagna. Thank you for the recipe! Do you freeze after cooking the entire thing? How do you reheat? Looks amazing! Any suggestions for replacement for the egg white? Thanks for sharing This delicious recipe with us! Absolutely amazing. A lot of flavor almost sinful. Wow! Thank you! SO much flavor – glad you loved! This recipe is absolutely amazing!! After savoring every last bite I had to share with my family. This meal is delicious and fits perfectly with my macros! 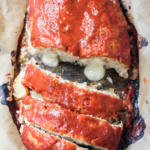 I did make a few adjustments; I used jar sauce (what I had on hand) and swapped the ricotta for low fat cottage cheese and it turned out delicious. I will definitely be making these again! WOW! Just made this and it’s amazing, didn’t miss the pasta at all. My husband said this is one of the best meals I’ve made. He is even taking it to work with him for lunch! I didn’t make it spicy and I substituted with a jar of Newmans Own Italian Sausage sauce and did add in a can of crushed tomatoes. Delish!!!! So great to hear! Love when you can surprise your family with a new recipe 🙂 Italian sausage sounds great! Made this tonight, substituted organic ground beef for turkey and it is fantastic! I plan to remake it with additional veggies. Also think the tomato sauce can be used over pasta for the rest of my family. Super easy too! Perfect! Yes – the sauce will be great over pasta as well. Glad you enjoyed! Do you freeze this after baking or before, if saving for later? I usually freeze it after baking! This recipe is amazing! I didn’t have diced tomatoes or Parmesan so I just used 28 oz of tomato sauce (had to add a couple of teaspoons of sugar to get the tang out) and did without the Parmesan. It was delightful! I’ll definitely be making this again! Hi Bridgette! I haven’t tried it, but I think you should be able to layer everything up in the crockpot to cook it. 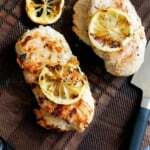 I just ran across this recipe online today. I started using zucchini and spaghetti squash instead of pasta as well as cauliflower rice instead of rice. My motivation was the diagnosis of pre-diabetes a couple of months ago. I am trying to keep it from being full blown diabetes. I am planning on making this for tomorrow night’s dinner. I can’t wait to try it!!!! Those are great substitutions! I hope you love this one – it’s one of my favorite comfort foods lightened-up with veggies 🙂 Enjoy! I made this last night for me and my boyfriend and it was super tasty! I added mushrooms to the sauce because we live mushrooms! Thanks so much for the recipe! We can’t wait to eat it again tonight! This looks so good! Quick question, do you think you could prep this a day before and then bake it the next night? Or would it be too soggy to have it sit overnight, unbaked in the fridge? Thanks! Hi Samantha! I think it should be just fine prepped the day before 🙂 Enjoy! Thanks Monique, it turned out great! Just a bit longer in the oven to fully warm up. Delicious! Great! So happy to hear that. Hi MaryAnn! I hope everything still turned out – such a great, easy dinner! This is a favorite in our house. We make our meat sauce with hamburger and I add fresh spinach to the layers. 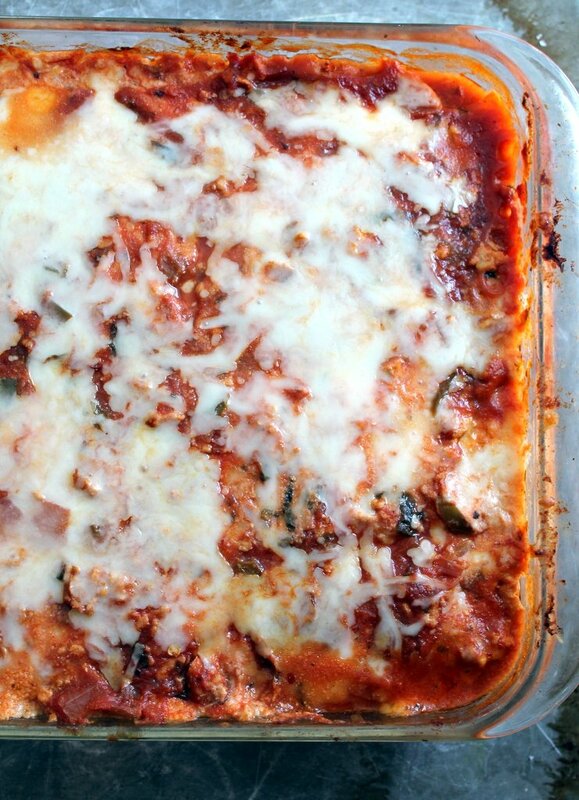 Such a good healthy version of lasagna. I’m so glad! It’s my go-to healthy version 🙂 Happy to hear that you all enjoy it! This was fantastic!! Thank you for sharing! You bet! Glad you enjoyed! Made it with Italian turkey sausage because that’s what I had in the freezer, whole lb. (16oz) whole milk ricotta, 0.66lb whole milk mozzarella, and an extra 1/2 cup of shredded parmesan over the top. Soooooo good! Came to 433 Cal/serving according to MyFitnessPal. Thank you!! This was wonderful! Thank you so much! Will definitely be making again.